Greetings one and all! It’s miserably hot and humid here, stagnant air abounds. From the wonderful breezy 80’s we slammed into the late summer temperatures, which must mean it’s July. Yikes! That means it’s time for me to get started on Christmas!! So with Christmas carols playing, the fan blowing a cooling breeze I pulled out all my Christmas goodies and got to it! Here’s the desk in mid action, you can glimpse one card there to the left completed on the outside, another laying on my craft sheet that attached to a piece of wood. Ink pad, glue, glass of water, paper cutter, paper scraps all around. The recycle bin is on the floor to the right. An open drawer to my tools is there too. Yes you spy two computers. The desk top in the corner on the right was playing my tunes and getting updates in the process and my laptop on the left was providing me with email and inspirations. So now off I go for more Christmas fun and off you go to The Stamping Ground to see Julia and what mischief she’s into these days! While you are there check out some other deskers from all over the world, it’s really something to behold! Gosh. Don't think I could make Christmas cards in this heat. Like what you've don't so far with yours though. 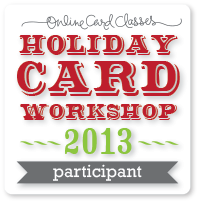 You have a wonderful space there for making all your Christmas cards. Despite my Christmas banner and countdown - I still have only about 15 made! Like Anne, I ran out last year....must get cracking soon. Your cards are lovely- well done. Please don't mention Christmas cards, I am hopeless at starting them early, I'm always on the last leg Lol! Oh my life, organised, cool and creating for Christmas! If you weren't so lovely, I'd be jealous!! Yikes! Christmas cards...... although here we are, half of the year has gone by. Great window to look out while you're crafting.